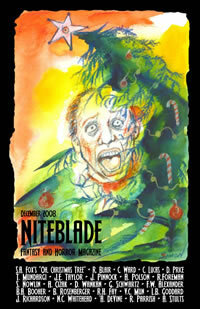 We love Niteblade readers. We really, really do. We think you rock, and you are one of the big reasons we, as writers, poets, editors and artists do what we do. With that in mind, we wanted to give you all a little something during this holiday season. Please accept this free download of the .pdf version of our December 2008 issue, “Oh, Christmas Tree” with our appreciation. Have a wonderful holiday season and we’ll see you right here again in the new year. Just a super quick update on the current status of submissions. Poetry subs are up-to-date for up to December 6th and fiction is caught up to October 22nd. I’m reading Niteblade submissions today. All day. That is the only thing I will be doing. If you’ve sent a submission, watch your inbox, hopefully you’ll hear from me soon. Taking inspiration from Holly Root who was seeking to empty her query inbox, I’m going to tweet about my progress. Unlike her I don’t actually expect to empty my mailboxes today but I’m going to make a pretty big push. If you want to read my progress it will be here Rhonda Parrish. I will try to update hourly. Any poetry submitted before 10/26/09 has been read and responded to as has any fiction submitted before 9/28/09. If you submitted after those days, I haven’t gotten to your sub yet, if you submitted before and haven’t heard back from me, please query. A teenage couple who will never grow up, and married couples together too long. The epitome of beauty, and a dream of dragons. A unique Christmas tree, and the secret behind the Clauses’ immortality. 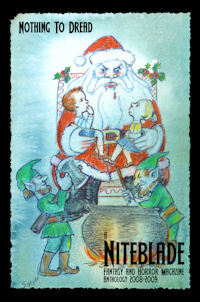 Seen in with a not-quite-mad hatter, and out with a wish for the dawn, the tenth issue of Niteblade brings back some of the year’s favourites. Along with tales based on an image by Marge Simon, this collection of stories and poems plays around the edges of naughty and nice. Nothing to Dread is finished and available for purchase as either a paperback or a download. I’m incredibly pleased with this connection and I hope you will be too. As I grow into my role as editor, I become aware of, and capable of, things that the year before I was not. One of those things is the Pushcart Prize. Niteblade has published a lot of fantastic works this year and it was my pleasure to nominate six pieces (the most we were allowed) for this year’s Pushcart Prize. Congratulations everyone, and good luck!